A discussion of the plans for the new Tappan Zee Bridge by the state cabinet today makes clear one thing — that the Cuomo administration continues to race to construction as fast as possible — while leaving other facets more confused and contradictory than ever. The cost of the bridge, for example, remains unknowable. “The cost at this point isn’t finalized,” said Thruway Authority executive director Tom Madison. The state is assuming a $5 billion price tag, he said, but once they hear back from contractors, “that could swing significantly in either direction.” In a federal loan application, the state said the project would cost $6 billion. Despite the potential for the bridge to break the bank — it will be twice as wide as the existing span — there’s no plan to slow down to see what toll- and taxpayers are on the hook for. According to Madison, design and build proposals are due in June and a contractor will be selected by the summer. Talk of how the bridge will be funded raised more questions. The funding will primarily come from tolls, said Cuomo during a press question and answer session. During the meeting, Madison stated that, “Any tolls will be consistent with the other Hudson River crossings and include deep local discounts.” The Port Authority’s bridge and tunnel tolls, however, won’t be enough to cover the cost of the new Tappan Zee, according to calculations by Charles Komanoff. The financing picture is even murkier. Madison said “pension fund or other private investment” is still on the table, contradicting past statements from DOT Commissioner Joan McDonald and the state’s official answers to questions from contractors. In discussing federal assistance, Madison said the state has applied for a grant from the TIFIA program. But TIFIA only gives out loans, which would need to be repaid. In contrast to fast-tracked plans for the enormous new automobile bridge, the Cuomo administration continues to shut the door on a transit component. Madison again cited numbers, which have been called into question by advocates and the media, that would put the cost of a bus rapid transit system equal to that of commuter rail, with figures that are five times the state’s best estimates from just two years ago. That kind of cost inflation is not credible without explanation, which the state has refused to provide. Governor Cuomo himself dismissed the widespread demands for high-quality Tappan Zee transit with some some pretty galling sophistry. “The bridge will be train- and bus-accessible immediately,” he said. “It’s not an issue about the bridge at all. The problem is that to have a rail service, you need development on the Westchester and the Rockland side that would cost billions of dollars, probably twice the cost of the bridge again to do the rail development.” He even bragged that he was building a bridge that was ahead of current transit plans. Of course, it’s not as if those calling for transit across the Tappan Zee don’t understand that infrastructure is required on either end of the bridge. It’s just that Cuomo killed that infrastructure when he killed transit service on the bridge itself. The administration also launched a new website to pitch its case for the bridge: http://www.thenewtzb.com/. Madison said the site would “ensure transparency” — which would be a welcome change given the history of the project under the Cuomo administration. Any idea about this comment? I would like to hear why the Cuomo administration is pushing for two single decked bridges when I would assume that a double decked single span bridge would have the same capacity with lower cost. I haven’t done the math myself, but it seems like removing the entire support infrastructure for one span would save a lot of money. This rush to spend as much money as possible without allowing thoughtful dialog in the process is just absurd. Our children will be paying for these mistakes for decades. The notion that we don’t have time to think about how to do this right is just flawed. Can somebody tell me exactly what transit is best and how easy a consensus can be reached about it? After all these years no solid plan has emerged. Then again, how hard is it to build a modestly expanded bridge with extra iron on either side on which to lay down some tracks or busway roadways in the future? Isn’t the fundamental problem here that people are going from everywhere to everywhere and that any transit package will leave huge numbers of potential riders unserved? I am very dismayed that in all the recent debate, pro transit people have not been putting any kind of vision about this front and center, just an endless whine of asking for ‘transit’. The most sensible solution to the TZ was (and is) to fix and tweak the existing bridge. But someone needed a contract to design, someone needed a contract to build and someone needed a contract to demolish. Since there was no rational basis for tearing down and replacing one of the regions younger bridges, the transit component (first rail, then “BRT”) needed to be dangled to stakeholders as “bait” to garner broader support. No matter that the MTA is just not known as a bold, expansionary agency and wasn’t seriously gearing up to run service over the TZ. No matter that the Thruway authority has never incorporated rail over its infrastructure. No matter that there were plenty of NIMBYs in the Rockland making their opposition known. Transit activists went for the bait, which was snatched away when no longer necessary. Now, you’re scratching your heads wondering how this could have happened. I could have told you this was coming from Day 1. Now, with transit gone, Cuomo is dangling new “bait”. Maybe, the old TZ can be turned into a walk-bikeway, a la the High Line. If you all STFU, of course. I call BS. The High Line only works because it’s woven through a neighborhood, with multiple entry and exit points and a high level of use. A TZ walkway would serve a much sparser population, so safety will be of concern. As it’s a huge bridge over a busy waterway, it will cost $$$s to maintain so it won’t impact river traffic. Mark my words. It. will. not. happen. The smartest argument by the walk/bike/transit advocacy community is not to keep pining for transit or to hope for a walkway. It’s to argue for a “fix it first” approach. The Tappan Zee was designed to be out of the range of the PANYNJ’s grasp so that it could collect tolls and use them for it’s own benefit. The Port Authority therefore has no say in funding or profiting from the Tappan Zee and by saying that the tolls here won’t be enough to cover the cost of the Tappan Zee is misleading. Hey, I like the idea of the Tappan Zee becoming a ped/bike bridge. Things could be worked out. Enought skepticism! A Cyclist: Perhaps you arrived late to this party without a perspective of what came before. Bike/ped/transit advocates have every reason to be skeptical. OTOH, if you’re willing to take the responsibility for seeing this project through, with all attendant complexities, then have at it. 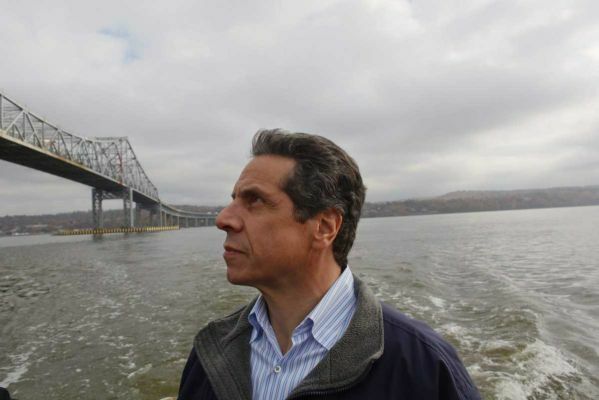 Will Cuomo Scrap Transit on the Tappan Zee and Just Widen the Highway?